Keep up to date with the SCOBA community through our termly e-newsletter, The Belltower, and the College’s regular magazine, The Quad. 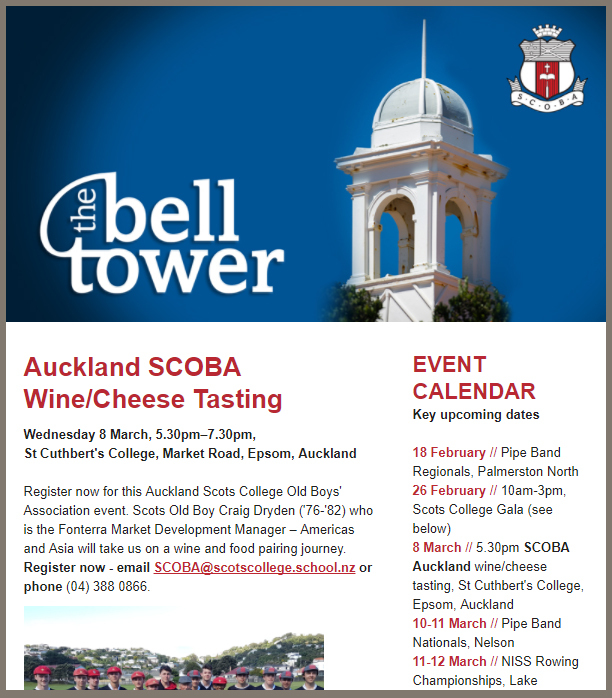 The Belltower includes upcoming SCOBA events, profiles on fellow Old Boys, news and updates from the community and College. If you would like to receive this newsletter please fill in the short form below. The Quad magazine goes out to all Old Boys, current families and wider Scots Community in Terms 1, 2 and 3. It’s the place to see what’s been happening during the term, future plans for the College, Great Scots profiles and much more. If you do not receive a Quad magazine and would like to please make sure to add your postal address or opt-in for an electronic copy below.